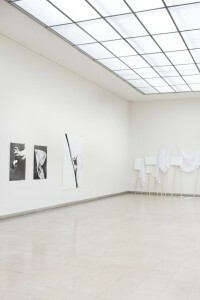 Kunsthaus Glarus is showing the first institutional solo show by the Zurich-based artists Markus and Reto Hubler (b. 1975). Over the past few years the twin brothers have chiefly attracted attention with collages and drawings, but also with sculptural works. Their works deal with issues of nature and civilisation. Their ambivalent relationship with science and society alternates between scepticism and fascination, irony and weirdness. In the supposed (natural) idyll, the abyss always lies in wait. Potential disaster is thus a constant presence in the exhibition. The safety of the achievements of civilisation, and thus human existence itself, first come under threat in the Seitenlichtsaal. Here huber.huber have opened up the tent in which they went camping during their childhood. With the openness of the Seitenlichtsaal to the park, nature and the romanticism of camping are also immediately present within the inside space. But its temporary location offers no security and no privacy, being made out of cheap, transparent construction foil. At night, however, the view of the stars from the tent is exciting. The artists have already addressed the subject of the tent, summoning up associations of dwelling-places for refugees, nomads and adventurers in earlier works and have, for example, investigated it in a series of drawings for its formal and typological qualities. 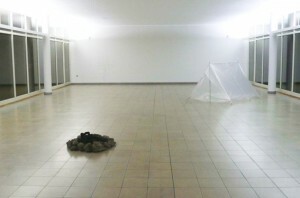 With the hearth in the work Fireplace (2008), the supposedly romantic mood is taken further. But the charred sculptures from unspecified foreign cultures lying the fireplace throw up a series of questions that cannot subsequently be answered. Under what conditions does a culture burn its own art-objects or those of another culture? Are the sculptures artistic artefacts or are they worthless souvenirs of the tourism industry? Or is an art-theft perhaps being attempted here? The scenerey is abandoned and apocalyptic. There is not a trace of human beings. Could they be fleeing meteorites? This question might be posed in relation to the collages in which small-town idylls in found photographs are threatened by plummeting meteorites. A swarm of flies, entitled Lethe (2007) – in ancient Greek mythology a river in the underworld – again hints at a distrous scenario. The preserved swarm of dead insects hanging above the floor has associations with both fertile life and death. Here the title of the exhibition, suggesting an apocalyptic past, is particularly striking: in classical antiquity the word Aletheia meant truth and forgetting. The Greeks believed that the souls of the dead had to drink from the river before they were reborn, so that they would not remember their previous life. The very title of the exhibition raises questions of past, present and future that seem to blur in a process of forgetting. Visitors to the exhibition experience a direct threat in the stairway, where a heavy meteorite, Meteorite Recon # C-081 (NWA) from 2008, circles above their heads. The cosmic stone was found in North-Western Africa, bought by the artists and placed in a new orbit in the Kunsthaus. The meteorite itself is an element which huber.huber repeatedly address in different forms. In connection with the exhibition title Before the Past it almost becomes the leitmotif of the potential threat. But it is also of scientific interest and fascinating to the collector. Huber.huber often work in series, pursue a particular theme over a long period or return to a particular aspect at a later date. A wealth of collected books and magazines forms the background to their collage works. They experiment with and compress the elements filtered from them until they become complex compositions and ambivalent pictures with a narrative content. 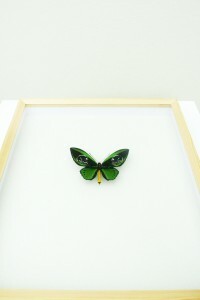 The works are characterised by ambiguity and mystery, symbolism and metaphor. 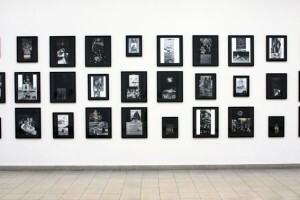 The collage series Dark Grounds (2007/08) on display in the Schneelisaal tells of mysterious encounters between man and nature. In these pictures, in dreamlike and enigmatic superimpositions of man and animal, mutations and reversals of proportion, veild stories unfold of a mysteriously enraptured world. In general, nature takes the upper hand over civilisation. 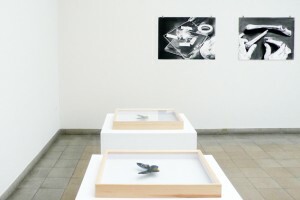 In a series of triptychs, the Sechstagewerk [Six-day Work] (2008), the achievements of civilisation, nature and technology, humans, plants and animals are also allusively juxtaposed with one another. The reference to the Bible passage about the creation of the world, in which God calls upon humanity to assume lordship over the earth and rule the world of plants and animals, becomes effectively dichotomous. 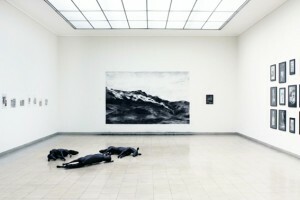 In the same room, in an equally nebulous large-format charcoal drawing, the Handhabung (Landschaft) [Handling (Landscape)] (2008), hidden in the fog behind the idyll of the almost romantic hilly landscape there lies the site of the USSR’s first underground nuclear experiment. The supposedly sleeping wolves that lie as sculptures in the room are dead, hunted and shot because after their reintroduction into Switzerland they penetrated too far into human territory and threatened civilisation. 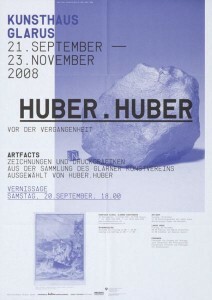 Huber.huber dismantled professional model copies of an average animal of this species which are used as the basis for animal preparation, reassembled them into recumbent animals and are now showing them in the museum. 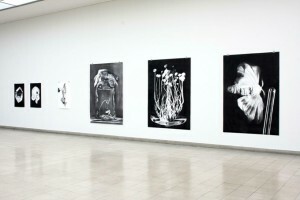 In a series of large-format charcoal drawings, the Handhabungen (2008) that are being shown in the large Oberlichtsaal, man intervenes in the phenomenology of nature in scientific experiments. The small-format models for these charcoal drawings have been borrowed from antiquarian popular scientific journals and scientific literature. They are depictions of simple experiments with animals and plants, or of scientific achievements such as the picture of the skull in the first operation on the brain, or experiments in the hypnosis of birds. One aspect crucial to the fascination of these models is the fact that in the small-format black-and-white prints a human hand has generally altered nature’s skill and thus become responsible for new creations. The beauty of the butterflies decorated with death’s-head silhouettes with the title Leichter als 21 Gramm [Lighter than 21 Grams] (2008) does not conceal the fact that they are human interventions using laser treatment. The symbolism of the butterfly alternates between symbols of the soul, immortality, transformation and ill-omened messengers of death. The death’s-head moth with the pattern on its back resembling a humen skull was seen in many places as a harbinger of death. In these works animal experiments and gene technology are implicit continuations of the experiments depictions by huber.huber. 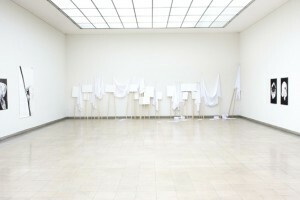 An installation entitled Die andere Seite [The Other Side] (2008) in the same room possibly protests against such technologies. At the same time the white banners are open to other political opinions and refer to the interchangeability of political statements and convictions.